It’s about how we draw from “a vast arsenal of assumptions about how the world works” as well as the discoveries made by our predecessors; and “…it validates what thinkers, artists, designers, writers, poets, musicians, and scientists (albeit too few of these) consistently admit: we cannot account as to the origin of the initial idea or notion that launches our investigations.” These ideas seem to have a lot of currency in pedagogical theory, and a wide-reaching power. 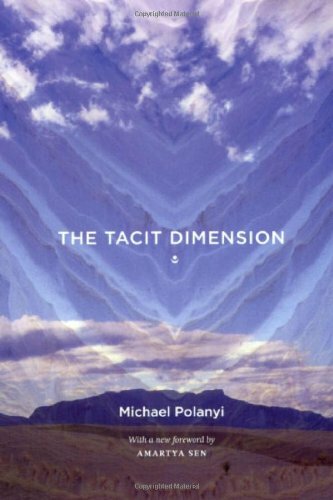 The Tacit Dimension is based on a series of lectures Polanyi delivered at Yale in the early ‘60s, and is a “deeply philosophical book, full of penetrating ideas, particularly about the knowledge of the world and the world of knowledge…” One thing I didn’t know: Polanyi actually become well-known as an innovative scientist before he rose to prominence in philosophy and the social sciences. It seems he tasked himself with no less than understanding the world and the workings of knowledge; he was a polymath, of “limitless curiosity”, who draws on deep understanding of many fields to probe the depths of human knowledge and understanding. Impressive dude! I actually have another, longer book by Polanyi — Personal Knowledge — which I picked up at a used bookstore in Seattle, and still haven’t yet cracked open. But apparently this is a much more condensed and accessible book; perhaps I should pick up this one to read first!